By now I am sure you are well aware of what happened to me on Wednesday, January 14. I was on the cover of a magazine. A running magazine. An online only, digital magazine. Me. Little ol’ me who’s nothing special. Just a regular gal who lives in small-town America who loves running, fitness, eating, wine, Weight Watchers, shopping, beer and…social media. Yes, to say I love social media is an understatement. I am a Facebook fanatic (click HERE or HERE), I dabble a little here and there with Twitter, I’ve been on Pinterest a few times (not nearly enough! ), I’ve been a part of the blogging scene since 2009 and I am definitely a devotee of Instagram. I can hashtag the crap out of a photo! And that’s how it happened. Hashtagging. On Instagram. This is a screenshot from Instagram off my computer. On November 30, I Instagrammed this picture of me that was taken by Heidi Hasapopoulos. It was after my hubby and I ran the local YMCA Turkey Day 5K. Heidi was gracious enough to volunteer her time and her talents that day and captured some great photos of runners – frozen runners!. In fact, some of her pics even made it into the local paper, the Echo Press. Heidi isn’t a full-time photographer. She dabbles with it on the side. But I think she should maybe think about doing it professionally. Her action photos are amazing! Anyway, Miss Hashtag Queen (that would be me! ), sometimes gets carried away with tagging photos. Just a note, in the photo above, you can’t see ALL the tags I used. And not only do I hashtag the photos, I also “direct” them at people and businesses by using the @ symbol. I follow a lot of running “stuff” on Instagram, including some magazines such as Marathon Running, Women’s Running and Runner’s World. Whenever I have a photo that is running related, I always direct it at those magazines and even tag them in the photos. Why? To be honest, now that I actually sit here and think about, I am not sure. I’ve seen other Instagrammers who run that do it, so I guess I just started to do it. And that’s how it happened. 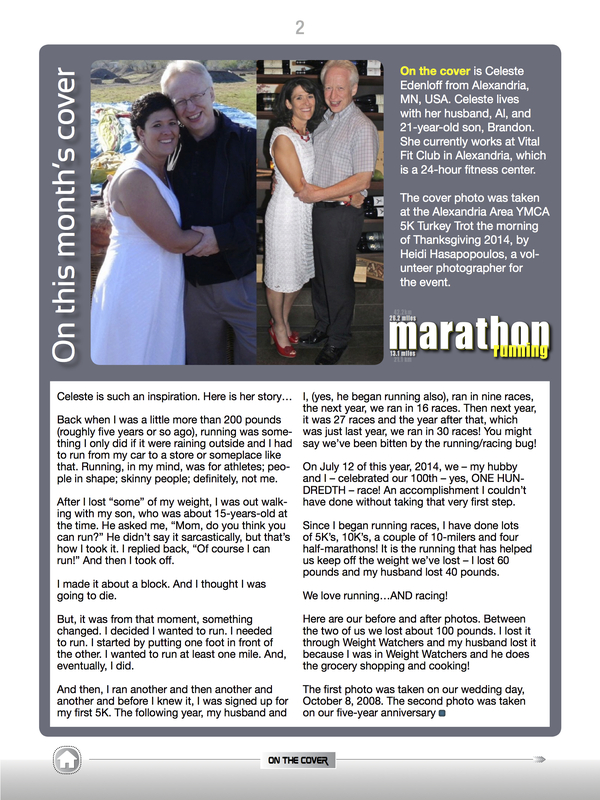 @marathonrunningmag. I hashtagged #marathonrunningmag. I tagged @marathonrunningmag. And then…I got a response. 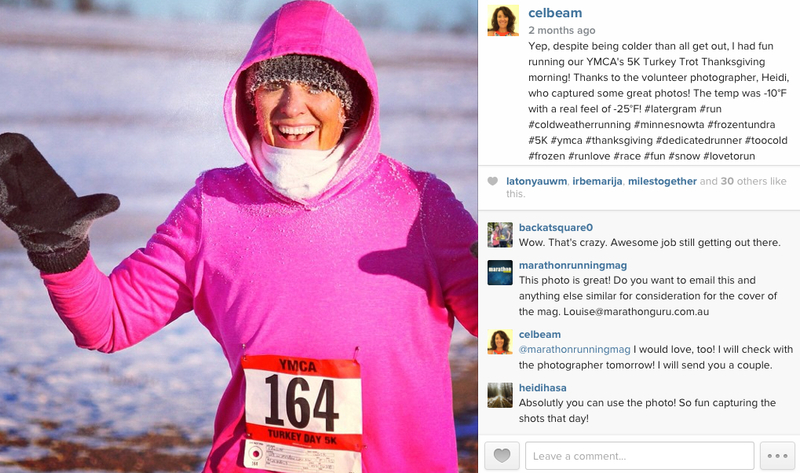 celbeam: @marathonrunningmag I would love to! I will check with the photographer tomorrow! I will send you a couple. heidihasa: Absolutely you can use the photo! So fun capturing the shots that day! And then, the rest is kind of history. I emailed Louise several photos, including the one pictured above. She got them, thanked me for them. Then she asked if I would include some information, such as where I was from, where the photo was taken, a bit about my myself and my running career and anything else I thought would be interesting or relevant. Being a former reporter, I thought I would save her some steps and actually just write the story for her. So, that is what I did. And then I sent it to her. Little did Louise know that I saw the cover on Marathon Running’s Instagram account long before she emailed me. By the time I got the email, the photo was already posted on both my Facebook accounts and was in the process of being posted everywhere else. To say I was excited and giddy like a little kid at Christmas is an understatement. I was not excited because I think I am all that, I was/am excited because running is something I never imagined in my life ever doing. At more than 200-pounds at one time in my life, running was NOT on my radar. Running was for athletes. Fit people. Not me. I couldn’t run a block to save my soul. If you want to download a pdf version of the January issue of Marathon Running magazine, click HERE. After doing a little digging, I think I figured out that the magazine is based out of Australia. Yes, Australia! Now that’s cool! This is an amazing story! Thanks for sharing. It’s amazing how much power is in a hashtag! 🙂 You’ve inspired me to hashtag more! Congratulations and I love the article! You are really inspiring. Congrats again and well deserved. Congratulations! This is awesome and that picture is so cool! Love your red shoes in the article photo! Congrats on running in that freezing temp! Previous Previous post: Feeling honored and appreciated! Next Next post: A mish-mash mess!